A laser produces a beam of highly concentrated light. Only certain types of lasers produce the kind of energy that will permanently affect the hair follicle. The Laser light acts on the pigment in the hair follicle – the darker and coarser the hair, the easier it is to remove. Both blond and white hair will have little or no response to laser hair reduction. Each laser pulse is a fraction of a second affecting several hairs at one time. Redness and local swelling of the skin, similar to sunburn, may occur in some clients--typically last for several hours or less. 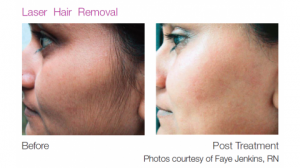 HOW DOES LASER TREATMENT COMPARE TO ELECTROLYSIS? 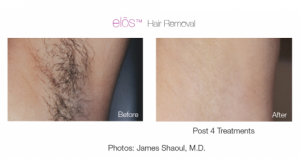 Electrolysis is one hair at a time, and the Electrologist can only get the hairs that they can see. The laser sees all of the hairs that are actively growing, even those beneath the skin. Electrolysis can be many years of regular treatments. Laser can treat large areas in a fraction of the time and requires many fewer treatments for a better overall result. Sadly, Electrolysis is often the best option for white or blond hair. 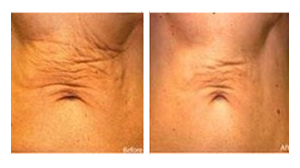 In many cases, significant improvement is realized in as few as 4 to 5 treatments for legs, underarms and bikini. In our experience, the face usually requires 8 to 9 treatments to be hair free. For best results schedule treatments 6-8 weeks apart. Inform your provider if you have a history of sun/fever blisters, cold sores or herpes. If you are taking Tetracycline or Accutane and if you are using Hydroquinone or Retinoic acid we also need to know. These drugs will increase your sensitivity to the laser, so it probably is best that you have not taken these for a year. Following your treatment you can return to normal activities immediately. SPF 45 or greater sunscreen is recommended on any areas exposed to the sun for the entire treatment time. We can treat tan skin, but not sunburned skin. In the next two weeks you may experience what seems to be regrowth of hair. Most of these hairs are being shed as a result of your treatment and are not regrowing. In-between treatments you should not wax or pluck the hair, only shaving will not harm your end results. Laser treatment fractionally applied can stimulate collagen growth within the skin. But is that enough? 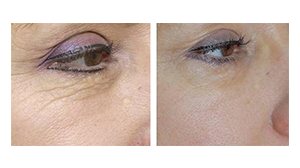 What if you can topically improve the rate of collagen re-growth and skin remodeling? Our Defining Gel does just that… and dietary supplements like our Hair, Skin & Nails provides a rich supply the much needed protein building block molecules essential in collagen replenishment. It is easy to see, and understand, that the triple prong approach is more likely to succeed than any single modality by itself. In many cases, significant improvement is realized in as few as 1 or 2 treatments, with optimal results in 4-8 treatments. For best results we schedule treatments 4-8 weeks apart. Cellulite and stretch marks often require several months to a year. Often like… nothing at all due to the 650ms pulse duration of our laser. However, some clients report slight discomfort such as a mild stinging sensation only when the laser pulse is delivered. The length of a laser session is typically only a few minutes, but may be substantially longer for large surface. Following your treatment you can return to normal activities immediately. Sunscreen is recommended on any areas exposed to the sun for the entire treatment time. We can treat tan skin, but not sunburned skin. Redness and local swelling of the skin, similar to sunburn, may occur in some clients. These effects typically last for several hours or less. In rare instances, blistering may occur. Please inform us, as soon as possible, of any problems. Laser effects are permanent. However, new hairs, stretch marks, sun damage, skin tags, cellulite, etc. will continue to develop over time, but can be slowed by eating better, exercise and decreasing sun exposure. Additionally liberal use of SPF 45 sun block, a good regimen of nutriceutical supplements and topical cosmeceuticals can help ameliorate new skin issues. Most podiatry clients use laser treatment for nail fungus, warts or spider veins of the ankle and foot. A laser produces a beam of highly concentrated light. Only certain types of lasers produce the kind of energy that will permanently affect the soft tissues involved in podiatric treatments. Each laser pulse is a fraction of a second affecting a small region of tissue or nail. The Light Pod Neo laser pulse is so fast that it increases comfort and reduces pain, so safely, while soothing and protecting your skin as it glides along. The length of a laser session is typically only a few minutes, but may be substantially longer for complex spider veins, depending on the size of the area being treated. While veins tend to show changes quickly, nail fungus elimination isn’t fully appreciated until the new non-infected nail grows out which may take several months up to a year. In many cases, significant improvement is realized in as few as 1 or 2 treatments for nail fungus, 2 to 4 treatments for warts, and usually requires 2 to 4 treatments for spider veins. For best results we schedule treatments 6-8 weeks apart. Although many patients report little or no discomfort, some may experience a mild stinging sensation only when the laser pulse is delivered. The Light Pod Neo helps sooth the skin as the laser pulse is delivered. Laser effects are permanent. However, shoes and carpets, as well as other surfaces at home can harbor the micro-organisms that cause fungus and warts, so re-infection is an issue if these are not cleaned and disinfected. Acne is extremely common and affects most Americans at some time in their life. Acne is the most common skin condition and primarily affects teenagers undergoing hormonal changes. It usually gets better after the teen years. Some women who never had acne growing up will have it as an adult, often right before their menstrual periods. Acne, or acne vulgaris, is a skin problem that starts when oil and dead skin cells clog up your pores. If germs get into the pores, the result can be swelling, redness, and pus. Sadly Acne causing bacteria are virtually everywhere. Indeed, they are the most common germs on our paper currency. • Some people call acne blackheads, blemishes, whiteheads, pimples, or zits. • When you have just a few red spots, or pimples, you have a mild form of acne. • Severe acne can mean hundreds of pimples that cover the face, neck, chest, and back, or bigger, solid, red lumps that are painful (cysts). 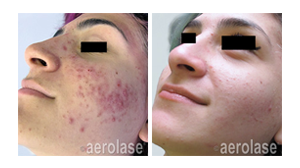 • Severe acne can scar the skin. There are many reasons you can get acne as an adult. Stress or changes in your hormone levels, like menopause or switching or stopping birth control pills, are two possibilities. Some people seek treatment for cosmetic improvement; others are looking for relief from pain. Whichever category you may be in, help is available. Although many patients report little or no discomfort, some may experience a mild stinging sensation only when the laser pulse is delivered. Immediately! Just try to keep the area clean and remember to use SPF 45. In many cases, significant improvement is realized in as few as 1 to 2 treatments till clear. Typically, 2 treatments/week for 4 weeks. In some cases, new outbreaks may appear and therefore additional treatments may be necessary with re-treatment in 4-8 weeks. Striae distensae, or stretch marks, are scar tissue in the dermal layer of the skin that result from rapid growth or weight gain. Collagen and elastin are not produced fast enough to accommodate the expansion of other cutaneous layers, rendering the normally elastic dermis less flexible and manifesting in visible epidermal marks appearing as pink, red, or purple lesions, known as striae rubra. The lesions, if untreated, become white (striae alba) and the texture of the lesion may change from swollen to flattened or moderately depressed. Up to 90% of teenage girls as well as pregnant women are beset with striae distensae. Inform us if you have a history of sun/fever blisters, cold sores or herpes. If you are taking Tetracycline or Accutane and if you are using Hydroquinone or Retinoic acid we also need to know. These drugs will increase your sensitivity to the laser, so it probably is best that you have not taken these for a year. Following your treatment you can return to normal activities immediately. Sunscreen is recommended SPF 45 on any areas exposed to the sun for the entire treatment time. We can treat tan skin, but not sunburned skin. Sometimes redness and local swelling of the skin, similar to sunburn, may occur in some clients. These effects typically last for several hours or less. In very rare instances, blistering may occur. Please inform us, as soon as possible, of any problems. Laser effects are permanent. However, rapid growth can cause stretch marks to recur. *SINCE EVERY PERSON IS UNIQUE, RESULTS MAY VARY. OPTIMAL RESULTS TYPICALLY REQUIRE MULTIPLE SESSIONS (USUALLY 4-8) AND ARE NOT GUARANTEED. 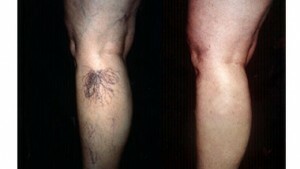 NEWER RED AND PURPLISH STRETCH MARKS OFTEN RESPOND BETTER THAN OLDER WHITISH ONES. Sometimes we want to stand out when we are younger. Later in life we realize that we didn’t make the best decisions about what we did to our bodies. Do you have a tattoo and don’t know what to do with it now? Laser tattoo reduction is the solution. Lasers work by producing short pulses of intense light that pass through the top layers of the skin to be selectively absorbed by the tattoo pigment which breaks down into smaller particles that are then removed by the body’s immune system. The length of a laser session is typically only a few minutes, but may be substantially longer for complex cases, depending on the size of the area being treated. While early results tend to show changes quickly, total elimination isn’t fully appreciated until the ink has cleared which may take several months up to a year. In many cases, significant improvement is realized in as few as 1 to 4 treatments. For best results, schedule 4-8 treatments typically 4 weeks apart. *SINCE EVERY PERSON IS UNIQUE, RESULTS MAY VARY. PLEASE FEEL FREE TO DISCUSS ANY ASPECT OF THIS TREATMENT WITH US. WITH YOUR INPUT, TOGETHER WE WILL ACHIEVE THE DESIRED RESULTS!